Read part 3 of the Battle of Yarmuk here. "...how often has a small force vanquished a large force by the permission of Allah? Allah is with those who steadfastly persevere." Standing on the hilltop of Jummu’a, Khalid (RA) placed his foot on top of a large boulder. His forearms bore the brunt of his weight as he leaned forward on his thigh. Khalid (RA) watched intently as the Romans lined up into battle formation. He was looking for cracks in the defense that he could exploit and make last minute adjustments to his plan. Khalid (RA) was going to rely on speed and mobility, he was going to blitz this army and anything that could slow him down had to be dealt with. His train of thought was interrupted when a hulking Roman on a heavy war horse trotted out arrogantly into no man’s land and threw down a challenge. Judging by his colorful ornamentation, Khalid (RA) deduced that he must be a high ranking general; and a warrior of similar status had to meet him. Khalid (RA)’s pulse quickened at the thought of fighting this fine specimen. Khalid (RA) straightened to study his opponent for a second then quickly hastened down the hill. He mounted his Arab steed and rode off toward Abu Ubaidah (RA), his Supreme commander. From Abu Ubaidah (RA), he learned that the warrior was Gregory; the general of the Roman right flank. Gregory had a reputation for being a powerful fighter and he looked it too. Khalid (RA) assumed he would answer the call but Abu Ubaidah (RA) insisted; as the Supreme commander he would answer the challenge. Khalid (RA) protested but Abu Ubaidah (RA) ignored him. He gave the army standard to Khalid (RA) and with an intense look said, “If I do not return you shall command the army, until the Caliph decides the matter,” and rode off to meet Gregory. Abu Ubaidah (RA) was a man in his early fifties. He was tall, slim and wiry. He had a lean and clear cut face with a thin beard. His eyes showed understanding and gentleness. Abu Ubaidah (RA) didn’t need a title to be respected. His toothless smile displayed his high rank. He accepted Islam after Abu Bakr (RA) and was one of the blessed ten guaranteed paradise. The Prophet (SAW) called him the “Trusted one of the Nation”. At the battle of Uhud, Abu Ubaidah (RA) was at the Prophet’s (SAW) side when the Prophet’s (SAW) helmet was struck and two links of chain mail were deeply embedded in his cheek. Abu Ubaidah (RA) bent over, clenched the link with his front tooth and yanked it out; and did it again for the second link. It gave visible comfort to the Prophet (SAW) but he ripped out his own front teeth at the same time. From that day forward he had the toothless smile which was the envy of all Muslims. The two generals met in the middle. Both armies watched in expectation as their commanders squared off. Abu Ubaidah (RA) and Gregory were both excellent swordsmen. They circled each other and after exchanging blows for several minutes, Gregory withdrew and started to retreat back to his line. Abu Ubaidah (RA) watched and nudged his horse forward. 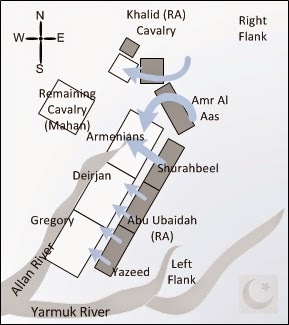 Gregory’s retreat was a trick designed to bring down Abu Ubaidah (RA)’s defenses. 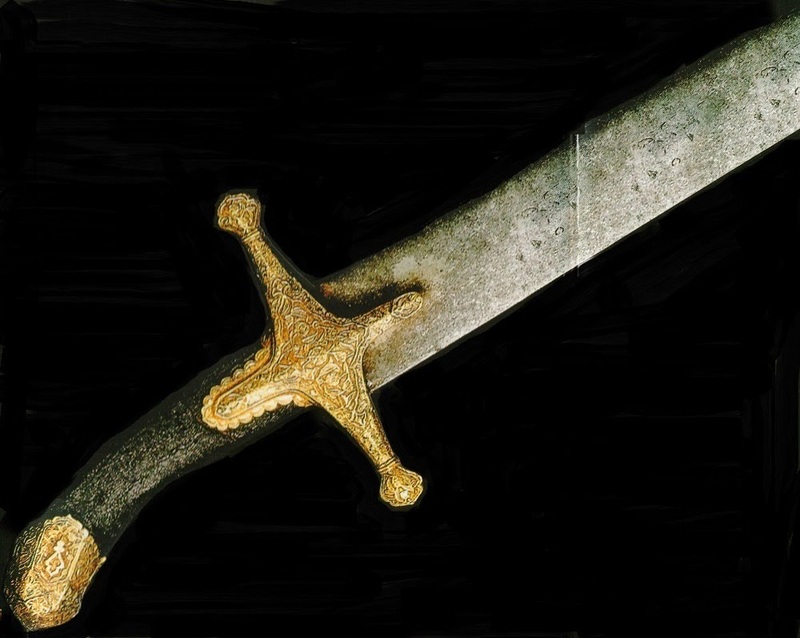 As Abu Ubaidah (RA) caught up, Gregory turned and raised his sword to strike. But Abu Ubaidah (RA) was no novice. He lurched forward and struck Gregory at the base of the neck. Gregory’s sword fell from his hand and the enormous man slumped to the ground. Shouts of “Allahu Akbar” rang out from the Muslims side along with the rattle of swords banging against their shields. Abu Ubaidah (RA) stared at the dead general and ignoring the ornate armour and weapons, he pulled on the reins and trotted back to his men. Abu Ubaidah (RA) had a habitual disregard for worldly possessions. Khalid (RA) stood just ahead of the infantry watching his commander dispose of the Roman general. Convinced the duel was over, he slipped through the Muslim line and urged his horse into a gallop to join his men of the cavalry. The officers stood in a group, displaying a quiet confidence. As Khalid (RA) approached, they fell silent. Their orders were clear so Khalid (RA) reminded them that speed would be the deciding factor on this day; they had to move fast and without hesitation. With this small pep talk, the officers disbursed and joined their units, leaving Khalid (RA) alone in contemplation. “Have I committed the entire army to death?” thought Khalid (RA). The burden of command rested on his shoulders. The previous day he convinced the senior commanders to continue the battle. They accepted his opinion and trusted him completely. Khalid (RA) closed his eyes and the air drained from his lungs. His shoulders sagged and his head bowed down. He whispered a prayer of assistance to Allah. Satisfied, he opened his eyes and thought “this is not the time for doubt.” He called out to his deputy and ordered the general assault. The Mu’azzin several hundred meters away, upon hearing the cry of the Mu’zzin on the right, yelled “Allahu Akbar!” From the periphery Khalid (RA) watched the center army charge screaming “Allahu Akbar!” A domino effect went all the way down the line. The men along the entire 11 mile front surged forward across no man’s land. 30000 Muslims slammed into 80000 Romans. 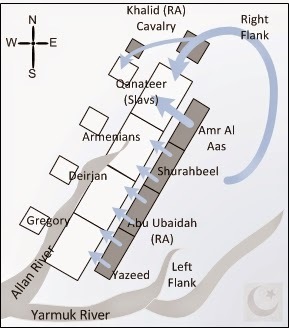 Khalid (RA) ordered his cavalry forward in formation; they trotted close behind Amr al–Aas’s men. 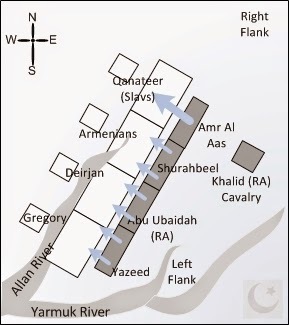 Khalid (RA) noticed a gap forming between the Roman infantry and the Roman cavalry. 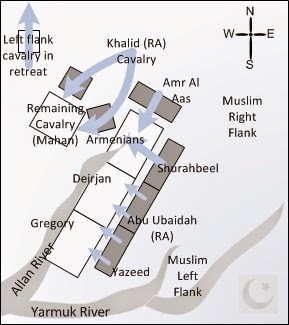 As soon as Amr’s men engaged, Khalid (RA) broke out into a fast gallop and surged right. 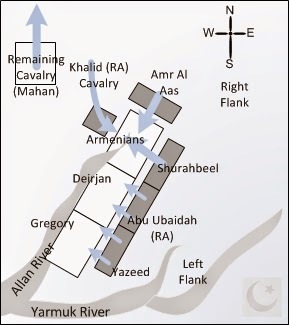 The entire cavalry followed Khalid (RA)’s lead and formed an arc behind him as he raced around the Roman flank. Khalid (RA) could see over his left shoulder the fight raging between the opposing armies. He could hear the clash of swords and shields and the shouts of men but he kept nudging his Arab stead faster. As Khalid (RA) passed the scrimmage line, the arc turned into the Roman flank. As they turned, a small detachment broke loose from the main body and charged the stunned Roman cavalry. Their purpose was to keep the Roman cavalry occupied while Khalid (RA) and the rest laid waste to the infantry. As Khalid (RA) neared the Roman infantry, he slowed and allowed the rest of the cavalry to form up beside him in a line several rows deep. Khalid (RA) steadied his lance and yelled “Allahu Akbar!” The others followed his lead. Each drew his weapon of choice and yelled “Allahu Akbar!” With lances, swords and spears pointing directly at the Roman flank, Khalid (RA) and the cavalry crashed into the defenceless Roman infantry. The Roman foot soldiers on the flank saw a black cloud of horses fall upon them like thunder. Those who could broke formation and ran. Those further in were blindsided. Khalid (RA) impaled the first soldier with such force that his lance snapped like a twig. He threw the snub away, drew his sword and slashed at anything in a red tunic. His horse twisted and turned to keep the foot soldiers away and at times stood on her hind legs if anyone came too close. The cavalry wreaked havoc in the ranks. The Roman soldiers fought a determined Amr from the front and now the cavalry from the side. With no support from their own cavalry, the infantry of the Roman left flank collapsed and fled. Blood dripping off his sword, Khalid (RA) surveyed his handy work. The Roman infantry with their backs to the Muslims were in full retreat. He displayed no expression of satisfaction, the battle had just begun. Swords and shields, amour and helmets lay strewn on the ground among dying and dead bodies. He scanned the field with steely eye, searching for Amr’s standard. He found it; it was still standing. 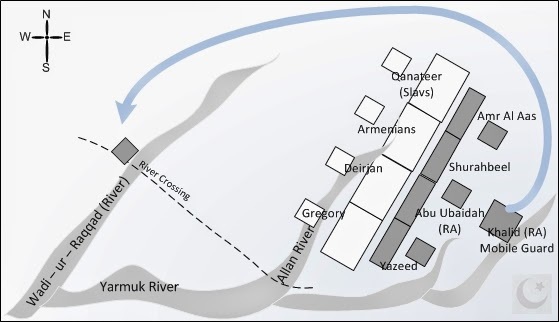 He searched for assurance that Amr was following through with the next phase, which was to swing his division around and attack the exposed flank of the Armenians (Roman centre). He could see the regimental banners swing around, the squad leaders barking orders and the disarrayed men quickly flocking to their colours. He looked further down the line to see if he could find Abu Ubaidah (RA) and Yazeed’s standard, but they were too far away. Abu Ubaidah (RA) and Yazeed were to engage but they were not to press the attack. Their role was to distract the Roman infantry on their front while Khalid (RA) took care of the right flank. Khalid (RA) could only hope things were under control. Satisfied, he snapped orders in quick succession to reorganize the cavalry. Without waiting for the entire unit, he charged straight for the Roman cavalry tied down by his small detachment. Shell shocked at the speed at which the infantry collapsed in front of them, the Roman cavalry had mentally lost the fight before Khalid (RA) and his reinforcements arrived. After taking a severe beating by the reinforced cavalry, they were driven from the field and galloped north to safety. Their day was done. Mahan, sitting on his horse behind the Armenians, watched in horror at the debacle unfolding before him. Before he had a chance to move, his infantry on his left had been routed and now his supporting cavalry was being mauled. Khalid (RA) moved with astonishing speed. He realized that if he didn’t move quickly the entire army would be enveloped. He gave desperate orders to all cavalry commanders to form into one powerful fighting force to counter Khalid (RA) and to move to the center. Mahan decided he would lead the cavalry himself. Cowardice was not in Mahan’s nature. Khalid (RA)’s mind raced. He was deep behind enemy lines. He overran the infantry and spanked the cavalry but he knew the Romans could still carry the day. Victory was within reach but he had one last obstacle forming to the south of his position, the combined Roman cavalry. He snapped quick orders to reorganize his cavalry but this time he waited. He was outnumbered at least 3 to 1 and would need every mounted warrior to take on this next challenge. He formed two units, one to attack from the front, the other from the flank leaving the north wide open. Khalid (RA) gave the order and the mounted warriors charged. The sun was just about to reach its noon time peak when Khalid (RA) led the charge on the flank. Pinched between the Armenian infantry on his left and the forming Roman cavalry on his right he raced across the field with his shadow racing to keep up. As he approached, he saw confusion in the Roman ranks. Some squads were in a tight formation and ready; others were in a loose formation and confused; and some even took a couple steps back at the sight of a fast moving and determined opponent. Khalid (RA) dug his heals and pushed his Arab steed hard. Mahan had a problem. He normally dispatched the Cataphracts as shock troops. This armoured heavy cavalry made up the back bone of his cavalry. They typically charged the main body of a set enemy position in a tight formation and plowing through. They had a devastating impact and usually decided the outcome of most battles. The Cataphracts were tough warriors; but in this type of fluid situation the heavy cavalry was at a disadvantage against the Muslim light cavalry. Khalid (RA)’s men could strike, disengage, manoeuvre and strike again. Mahan furiously shouted orders to position the various regiments into a fighting formation but before he could, shouts of distress came from the outside perimeter. He looked up and saw a black jagged line of horses charging his position. A cloud of dust billowed behind, covering the blue sky in a dark pall of doom. He was out of time. The Muslim cavalry scattered and engaged in small groups or individually. Without a target to charge at, the Roman Cataphracts took hits from all sides and could not counter. Seeing the futility of their situation, the cavalry broke and retreated, taking the protesting commander of the army, Mahan, against his will. 40000 Roman cavalry rode away leaving the infantry to their fate. For hours, Khalid (RA) and his men had ridden hard from one battle to the next, racing to stay ahead of the Romans. Now, silence fell over the field. The hooves of the retreating Roman cavalry slowly faded away in the distance, leaving a trail of dust. Beads of sweat rolled down Khalid (RA)’s cheek, absorbed by his beard. He slowly lowered his sword to his side, looked up to the heavens, closed his eyes and whispered a prayer of thanks. He felt a sense of calm run all over his body and relax his taut muscles. It was not apparent to everyone but he knew this battle was over. But just as quickly, reality checked in. The noise of fighting men behind him off in the distance filtered in. He may have run the Roman cavalry off the field but he still had to deal with the abandoned Roman infantry. He opened his eyes and saw his men staring at him with pride. These were men who followed him with unquestioning loyalty and faith; men who did not understand the meaning of defeat under Khalid (RA). Although their orders were obvious, they wanted to hear it from their great general. Khalid (RA) wheeled around in the direction of the Roman center. The standards of the regimental leaders were brought forward and the men flocked towards them. Khalid (RA) started out at a trot to keep his formation intact. As the sound of fighting grew louder, the wisp of arrows showered around them as the Roman archers became aware of the new threat behind them. As Khalid (RA) approached, panic took hold and an uncoordinated barrage of arrows rained down. Khalid (RA) finally broke out into a full gallop towards the helpless Armenians. The horror started in the rear as the archers turned and started shooting without orders. Loud shouts from stricken soldiers began to reach the front lines. The officers were hand cuffed. 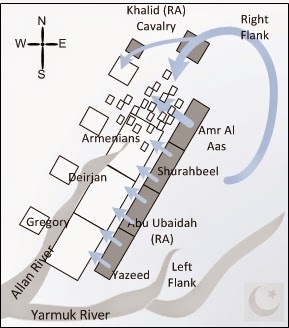 Men were committed to holding off Shurahbeel from the front and Amr on the flank. If the Armenians had a little more time, the officers may have been able to put up some defense, but Khalid (RA) was moving too fast. Once terror took hold, the infantry disintegrated. It was every man for himself. Swords and shields were discarded. Helmets were thrown aside. Men trampled over one another to get away from the carnage in the center. Those who escaped ran towards the banks of the Wadi ur Raqqad. To their surprise, Khalid (RA) did not pursue them. Further down the line, Deirjan saw that his Roman flank and rear were exposed and did an orderly withdrawal towards the Wadi. Khalid (RA) did not pursue them either. The rabbit was running straight into Khalid (RA)’s snare! 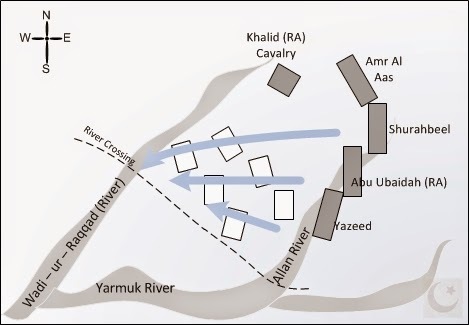 Khalid (RA) and the cavalry blocked the northern escape route which forced the Roman infantry to flee into a part of the battle field which made escape almost impossible. On the southern end of this field, the Yarmuk river ran through a 15 mile canyon with steep banks reaching as high as 1000 feet. On the western end flowed the Wadi ur Raqqad which was a deep ravine with steep banks. To add to this treacherous corner, precipices with a sheer drop of 100 to 200 feet lined the banks of both the Yarmuk and the Raqqad making a crossing across either river incredibly difficult if not impossible. But, there was one escape route. There was a ford located on the northern part of the Raqqad. The slope on the eastern bank was easy to traverse. The western side had a road on a steep bank and both sides of the road were precipitous creating a bottle neck at the top. The Roman officers were guiding their men to this ford. 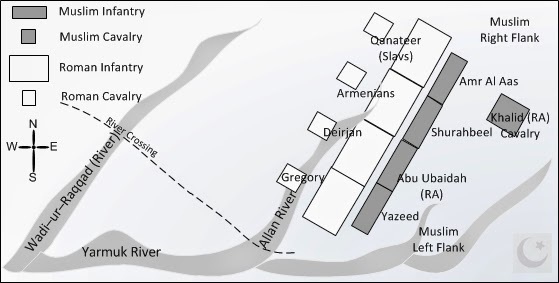 The leading elements of the retreating infantry dashed across the field trying to put as much distance between them and the advancing Muslim army. There were expressions of relief as they finally reached the ford. Some slowed to a jog and others started to walk trying to catch their breath. They quickly ran down the eastern slope, crossed the ravine and hiked up the western slope. As the road narrowed, they formed up into a column of men. As they reached the top, there were men standing, staring down at them. The Romans called out but, there was no response. They didn’t look like Roman soldiers, could they be slaves from the camp? It didn’t matter, they were safe. They quickened their pace to reach the top. Suddenly, rocks started to fall on their heads, arrows started to wisp by and then they heard the dreaded Muslim battle cry “Allahu Akbar!” Their passage was blocked! 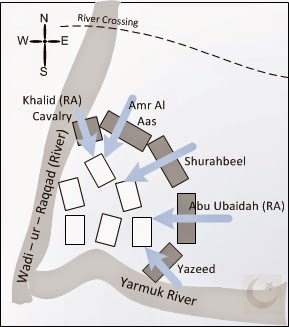 The previous night, Khalid (RA) had sent a detachment of 500 horsemen lead by Dhirar to make a wide detour around the Roman left, get behind the Wadi ur Raqqad and secure the river crossing on the western bank. They concealed themselves during the night and waited during the day. Because the road on the western bank was narrow, a small force could hold back an entire army. Several Romans reached the top but they were cut down. The leading elements fell back on those behind them and they fell back on those behind them. Once Dhirar and his men charged, an avalanche of men fell down the western slope. The Romans on the eastern bank saw their stricken comrades and realized they were trapped; surrounded by the impossible terrain behind them and the Muslims in front. The generals that remained hastily formed up their men for defense. The Muslims commanders formed a semi circle and moved in for the final kill. The final phase of the battle of Yarmuk had begun. The Romans were packed tight. There was little room for maneuver. Those on the front line fought heroically but in a futile effort. Rank after rank were cut down. Screams of delirium from the defenders were mixed with shouts from the attackers. Khalid (RA) and his cavalry used their hooves to knock down the tired defenders. Many dropped to their knees and raised their heads exposing their neck; indicating they were prepared to die... with honour. The last of the Roman defense collapsed and the battle turned to butchery. The sound of swords striking shields ceased and the sound of sword cutting flesh and cracking bones could be heard. The Roman rabble made a final mad dash to the edge of the ravine. The view to the bottom was terrifying, 200 foot drop with jagged rocks jutting out. Those reaching the edge of the ravine blindly pushed those already there. Ranks after ranks were pushed off the precipice with blood curdled cries. Those pushing from behind were hacked down. The carnage would continue from the late afternoon to evening. It would be nightfall before the blood soaked field would fall silent. The full moon lit the mounds of dead bodies. The stench began to fill the air. Soldiers searched for their wounded and dead comrades, others rested. As soon as news reached the camp, the women and slaves rushed out to tend to the exhausted army. The victory was total. Any chance of the remnants regrouping to challenge the Muslim army perished on the fields of Yarmuk. Syria lay open. As Khalid (RA) trotted back to the Muslim camp, he raised his right hand with his index finger pointing up into the black sky and testified. The battle of Yarmuk, Khalid (RA) bin Waleed’s greatest victory, came to its final bloody end. Akram. A.I.”Khalid Bin Al-Waleed: Sword of Allah”.Birmingham: Maktabah Publishers and Distributors, 2007. Ghadanfar, Mahmood Ahmad. "Commanders of the Muslim Army." Riyadh: Darussalam Publishers and Distributors, 2001. Kennedy, Hugh. “The Armies of the Caliphs.” London: Routledge, 2001. Nicolle, David. “Yarmuk 636AD – The Muslim Conquest of Syria.” London: Osprey Publishing, 1994. The contributions of the Islamic civilization are vast and I'm amazed at how little people are aware of this. I once heard a hypothetical question posed “How different would the world of today be if Islam never existed?” Many answered there would be peace, there would be no terrorism or no extremism. As if that is the only contribution Muslims ever made. My answer: "The modern world would not exist as it does today. The world would still be stuck in the dark ages." I blog about Islamic history from its birth in the 6th century right up to the end of the 19th century. I will dabble in every topic as best as I can. I will typically post once a month. To be sure you don't miss my new posts, subscribe via email. Just sign up above where it says "Follow by Email". You can contact me at naeem@forgottenislamichistory.com. © 2014, Naeem Ali. Watermark theme. Powered by Blogger.